This webpage is mainly focussed on running the official Asus/Xandros Linux on the Eee PC. The stuff on this page might also work on other Distributions, but has never been tested on anything else but Xandros. Disclaimer: Any content on this page might wreck to Eee PC to a state that makes a complete reflash of the solid state disk necessary. I am NOT resposible for any damage done to anything, if you try anything that's on this page! If you replace the 512MB RAM module with a 2GB one, the Linux supplied by Asus will only use 1GB of it. Here's what I did to overcome this limitation. Please read this documentation at least once in full, before starting any actions. It should save you some time. I will take no responsibility if these will short instructions will wreck your EeePC. If you don't like this, don't do it. First of all I compiled my own kernel from the sourcecode asus supplied. I used exactly the same configuration that Asus claims to use, except for the memory option "High Memory Support", where I selected "4GB" instead of "off". You don't have to do it, you can just download my kernel: vmlinuz-2.6.21.4-eeepc-2gb.bz2 (Size: 1298400; Date: 2008-02-01, 01:42 CET). Once you've got the kernel, copy it into the home directory of the default user (/home/user) on the EeePC. Since you can't copy it to the desired place directly use a Live-CD / Live-USB Linux distribution to boot the EeePC and log in as root at used the following commands to integrate the new kernel. The name of the partitions might differ from /dev/sdaX. Trying different live distros I've seen /dev/sdbX and /dev/hdcX. You can find out which one you should use by typing "fdisk -l". The disk you're looking for has a forth partition "EFI (FAT-12/16/32)"
"vi /eeepc/1/boot/grub/menu.lst" is the command used to open up the configuration of the boot loader. Of cause you can use any editor you like that comes with the distribution you use. nano is a very popular alternative. Just make sure that it doesn't fold the text automatically (nano uses the "-w" option). Duplicate the four lines starting with "title Normal Boot", the first one will be our new "2GB" entry and the other one will be the fallback solution. So, change the first of our new lined to "title Normal Boot (2GB)" and in the third one to "kernel /boot/vmlinuz-2.6.21.4-eeepc" to "/boot/vmlinuz-2.6.21.4-eeepc-2gb" just by adding "-2gb" at the end of the filename. # Configured by Xandros Configuration system. The inserted lines are bold, changes are in red. If anything is wrong with the new kernel you can switch back by holding F9 during startup and selecting "Normal Boot". Also note, that these changes is now part of the factory settings and will be unaffected by any restoration. This should do it. At least that did it for me. This is another kernel I compiled and a slightly modified initramfs instead of the unionfs, aufs (another union fs) is used. It fixed a problem for me that I wasn't able to mount filesystem-images via loopback. Integration is similar as described above. F9 and a reset to factory settings is strongly recommended for using this kernel and initramfs. (This kernel also supports 2GB of RAM.) They have served me well for several months until I sold my 701. That's it. Reads a bit complicated, but that's just because every single step has been described. This workaround is now obsolete, since fixed packages are available now. I compiled the source for d1x-rebirth for the Linux Asus supplies with the Eee PC. It works fine on my system. For installation download the supplied executable, unpack it with "bzip2 -d" copy it to /usr/local/bin and set the executable flags. Finally create the directory /usr/local/share/games/d1x-rebirth and put descent.hog and descent.pig in there. Run d1x-rebirth and everything should be fine. Happy hunting! Asus has released an update containing Firefox 3.0.4 and Flashplayer 10, making this package rather obsolete, at least for my Eee PC 901 (US Version) and 900A (German Version). When you want to install Firefox 3 on the EeePC you'll it won't let you start, because the gtk+ 2.8 libraries are too old. To fix this problem download this archive containing gtk+ 2.10 libraries, und untar it inside the directory containing Firefox 3. Then you'll get sufficient libraries that are only used by Firefox. Another tool of pure evil hacked together to get the Adobe Flashplayer 10 plugin working on Asus/Xandros Linux. The Flashplayer is compiled in a way that it needs at least a glibc-2.4. Debian 4.0 and Xandros only provide glibc-2.3.6. This tool patches the binary to request only a 2.3 compatible glibc instead of a 2.4 one. It is done without any elf tools, just by a simple binary search and replace. Feel free to take a look at the sourcecode. It works for me, as I just watched a YouTube Clip with a patched plugin on my Eee PC 901 running Asus/Xandros Linux. sudo renice -20 -p $! SLART is a little tool collecion for audio files. It's core component is Partyman, a double-deck-like audio player. Here you'll get everything you need, to install it on your Eee PC. "slart-prepare.sh" is a small script that downloads and installs the packages that slart depends on and that are not installed on the Eee PC. "slart" are the main programs and also contains the needed soundmix-daemon DerMixD, and "slart-helper" is an Easymode icon for Partyman. I hacked a small tool for the Xandros Linux distribution that sits in the system tray with the image of a light blub and allows to start/stop wireless lan, bluetooth, webcam, internal cardreader, 3G modem and ssh (if installed) individually. There are also options to shutdown or reboot the system without any further confirmation. When running on battery it also displays the time left as a tooltip. No big deal, but quite handy for me. To get it run on system start, put it in /usr/lib/fastlaunch or create a symlink there. Updated SLART package to release version 0.7.5-591. Updated slart-helper package to 0.2-2. Updated SLART package to release version 0.7.4-546. Updated SLART package to release version 0.7.3-457. Updated SLART package to release version 0.7.2-436. Updated SLART package to release version 0.7.1-415. Updated SLART package to release version 0.7-402. Updated eeetray to 0.8: added tooltip of time left when running on battery. Added note about flash10patcher and gtk+ libraries for Firefox being obsolete. Updated eeetray to 0.7: output of commands will be suppressed and fixed another bug on turning 3G modem on/off. 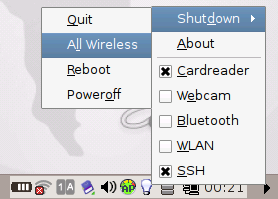 Updated eeetray to 0.6: added shutdown all wireless option and fixed bug on turning 3G modem on/off. Updated eeetray to 0.5: added 3G modem of 901 GO. Updated flash10patcher to 0.2: added script for generating .deb-package. Added aufs kernel and initramfs. Updated eeetray to 0.4: menu entries are only displayed when hardware / service exists. Updated eeetray to 0.3: icon changes during execution. Updated eeetray to 0.2: added camera & cardreader. Added gtk+ libraries for Firefox 3. Added recommendation about samba security leak. Added note about "F9 during startup"-feature. Initial release of this page and everything on it.